I often blog serious stuff here, sermons and the like, but I thought I would share something different and perhaps a little more personal. 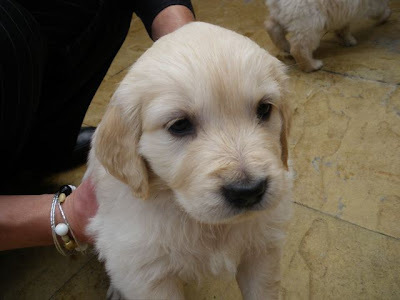 As a family we have been looking to increase our family, already fairly full with 5 of us, by getting a puppy. We hoped that this would be good especially for our boys, but in fairness for all of us. My darling wife has been doing a lot of research and reading, and a number of weeks ago now found what we hoped was going to be a good breeder and a good puppy. All we went well - we visited, paid a deposit, and finally collected Hetty (don't ask) a name chosen by son number 2. We brought her home to much joy and celebrating. Our lives were much richer with her in them. Sadly, all did not go well, as after a visit to a local vet for her vaccinations, we discovered she had a significant heart murmur and the vet told us that we should return her to the breader. We ummed and erred over this for a day or two but eventually decided that this was the right thing to do. It is amazing how attached we got to Hetty so quickly. She had a lovely nature. Having to tell our kids what we needed to do was one of the single hardest things I have ever done. We have since then kept our eyes and ears open for new litters, and then finally we found one not so far away in High Wycombe. We went across to see the litter and meet their owners on Saturday. The pups are beautiful and the mother is attentive but also very happy for others, namely us and the kids, to pick up and play with her puppies. We got on well with the owners too who were warm and welcoming and clearly church-goers - the statue of Jesus and icon of the Blessed Virgin Mary gave it away! All in all we are delighted and a deposit cheque hits the post in the early part of this week.